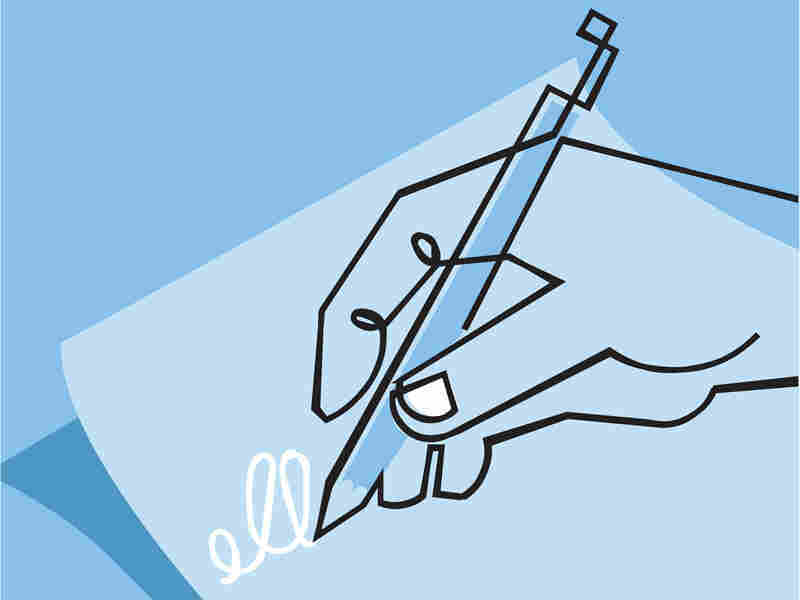 So Longhand: Has Cursive Reached The End Of The Line? Linguist Geoff Nunberg believes there's value in writing by hand — but he doesn't see why the letters have to connect. "You may as well dictate what song we all have to sing in the shower," he says. So Longhand: Has Cursive Reached The End Of The Line? Geoff Nunberg (@GeoffNunberg) is a linguist who teaches at the School of Information at the University of California at Berkeley. Is longhand doomed? People were predicting that as early as 1938, when The New York Times warned that writing by hand would soon be swallowed by the universal typewriter. Eighty years later, people are saying that it will soon be supplanted by the typewriter's souped-up digital offspring. Yet handwriting is on a tear right now. Five or six years ago, I'd walk into my Berkeley classroom and see rows of undergraduates peering over the lids of their laptops. Now most of them are writing in notebooks. My co-teacher and I don't impose a "no devices" rule as some others do, but we don't have to. The students have learned that they'll remember more of a lecture if they take notes in longhand than if they use a laptop. And the research confirms that. Does The Fight For A Cursive Comeback Miss The Point? That's not just because they're spared the temptation to keep checking Facebook. Handwriting has the virtue of being slower than typing on a keyboard. You can't just switch on autopilot and take down every word — you have to actively process and summarize what you hear. There was never any real danger that digital technology would replace pen and paper, no more than that it would kill the printed book. Yet we really have come to the end of an era, even so. The writing styles we use trace their ancestry back to ancient Rome. But until recent times they were always meant to be read by others, in manuscripts, letters, ledgers, reports. But once our graduating seniors hand in the blue books for their last final exam, they'll probably never again have to produce a piece of extended longhand to show to anybody else. They may use it to keep a personal journal or to write the first draft of a novel, as a lot of authors still do. But their longhand communications will be mostly limited to filling out a form at the DMV or leaving a note under someone's windshield wiper. Some of my students write in cursive. Others use some form of print. One writes in all caps, another in a rather elegant modern italic. But as long as their writing is legible, why should I or anybody care which style they use? Yet handwriting has become hugely political in recent years, with the rise of a movement that sees the neglect of cursive as a symptom of cultural decline. The creators of the Common Core didn't include cursive instruction because a lot of teachers thought it took too much time away from other things. But state legislatures in Alabama, California and a number of other states have mandated it — in Louisiana the drills continue all the way up to grade 12. And where schools aren't teaching it, there's a booming business in cursive summer camps. There's no sound reason for any of this. It's been shown that learning to write by hand has cognitive benefits, but it makes no difference whether you connect the letters or not. Cursive doesn't make a signature more legal. And though many may find this hard to believe, cursive actually turns out to be slower than print, though the fastest style is a hybrid of the two. But cursive is steeped in tradition. It evokes an age when American schoolchildren sat at their desks in identical postures making their loops with military precision. The drills trained them to join the growing legions of clerical workers — pen pushers, they were called. But they were also thought to build character. As the historian Tamara Thornton describes it in her book Handwriting in America, cursive instruction was intended to "reform the dangerous, ... discipline the unruly and accustom the dissatisfied to their role in life." Some people still talk about cursive instruction as instilling self-discipline. But the only jobs that require fastidious penmanship these days are tattoo artist or addressing wedding invitations. So modern advocates of cursive emphasize being able to read it, rather than write it. And kids do need to be able to decipher the letters they get from grandma. But experts say that once 6-year-olds can read print, they can learn to read ordinary cursive in an hour, without years of drills. Some conservatives say that neglecting cursive leaves students sadly unable to read our founding documents, like the original Declaration of Independence, the Mayflower Compact or the Magna Carta. But it's not likely any of those people have actually tried to do that themselves, inasmuch as the first of those documents is faded to the point of illegibility, the second isn't written in cursive and the third isn't even in English. In an age when most of our handwriting is just for our own eyes, why would we insist that everyone write the same way? You may as well dictate what song we all have to sing in the shower. I can understand the prejudice against print. When I was growing up, I thought of it as a childish form of writing that you abandoned when you started to learn grown-up cursive. But print styles go back to the Renaissance. And over the years, a lot of authors have chosen to use print over cursive, from Charlotte Brontë and J. R. R. Tolkien to Jack Kerouac and David Foster Wallace. In an age when most of our handwriting is just for our own eyes, why would we insist that everyone write the same way? You may as well dictate what song we all have to sing in the shower. Let the schools teach cursive, by all means. But as Anne Trubek, the author of The History and Uncertain Future of Handwriting suggests, it should be an elective, like signing up for band. There are so many nice ways to write; why not give students a free hand in the matter?